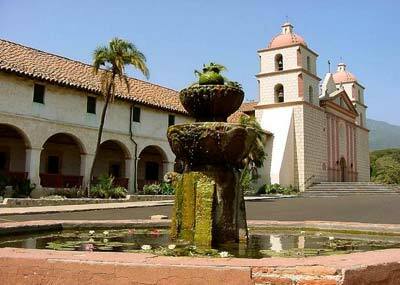 Known as "The Queen of the Missions," Mission Santa Bárbara in California was founded on December 4, 1786 by Father Fermín Francisco de Lasuén, who had taken over the Presidency of the California mission chain upon the death of Father Junípero Serra. It was the tenth mission founded, and was named for Saint Barbara. The Mission sits on a rise overlooking both the City of Santa Barbara and the Pacific Ocean; the Santa Ynez Mountains rise almost 4,000 feet in back. During the first few years, there were three churches built, each larger than the previous one. It was only after the great 1812 earthquake, which destroyed the previous buildings, that the current Mission was begun. The towers again sustained considerable damage in a 1925 earthquake, but were subsequently rebuilt. The appearance of the inside of the church has not been altered since 1820. Many elements of the Mission's extensive water treatment system, all built by Indian labor (including aqueducts, two reservoirs, and a filter house) remain to this day, as does a grain mill; the larger reservoir, which was built in 1806, has been incorporated into the city's water system. Mission Santa Bárbara is the only mission to remain under the leadership of the Franciscan Friars since the day of its founding until today. The original City of Santa Barbara developed between the Mission proper and the harbor, specifically near the Royal Spanish Presidio, about a mile southeast of the Mission. The Mission Santa Bárbara today continues to serve the community as a parish church. Shoreline Park was originally a landfill for San Francisco garbage. After the landfill closed, it was turned into a city park, with golf course and artificial lake. A video on the history of the park is available at the Mountain View public library. This gorgeous but functional structure is just 75 years old but it has the look and feel of a 200 year old Spanish Colonial. If you are planning to visit, make a point of going to the top of the tower - the view is spectacular. One of the nation's best small zoos, this is a visit for the entire family. The Zoo was developed like a park, with plenty of picnic and open areas. The animals are easily viewed and the setting is intimate. They say its a small zoo but there are 600 animals! This wonderful museum boasts an excellent combination of permanent and special exhibits. Although it's not an enormous museum (you can see it all in about 90 minutes), it has an impressive permanent collection of Asian art that is a must-see. One of the most significant historical buildings in Santa Barbara, El Presidio has been reconstructed faithfully based on historic and archeological evidence. It combines great beauty and real function, as it is the home for many events throughout the year. Another must see. From the outside you'd never really know that this was a wonderful museum with some fabulous vignettes. Since it was initially built (~1817) the Casa has been the center of civic, political and even social affairs. One of the many surprise finds, this excellent museum displays the flora and fauna of Santa Barbara and the Channel Islands. There is also an extensive section on Prehistoric Native American life. These wonderful gardens are a bit out of the way, but definitely worth the trip. There are many events planned by the Gardens staff that give dyed-in-the-wool botanists and new enthusiasts alike something to learn. This museum features both permanent and changing exhibits that share Santa Barbara's colorful past from the Native American age to modern times. This is a fascinating small museum located right on the waterfront. It is filled with artifacts, displays and history all about the impact of the sea on the local inhabitants ranging from the Chumash to present times. Built by a prominent ranching family in 1873, Stow House is a rambling two story house and is the oldest frame house in the Goleta Valley. The Railroad Museum offers antique railroad artifacts, photographs and hands-on exhibits are shown in the agency office and the passenger waiting room.